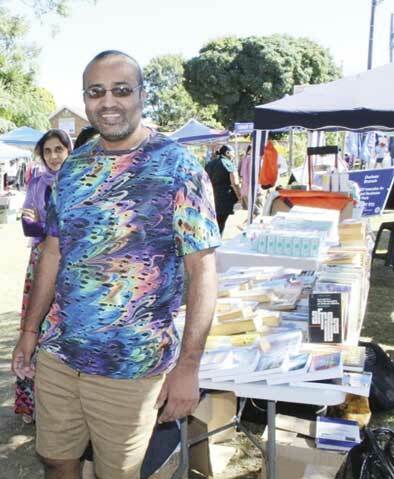 Anivesh Singh is a social entrepreneur who is also dedicated towards promoting reading within Durban. He is the founder of Ripple Effect Health and Wellness booklets. Singh holds a BA degree majoring in Political Science and Law from the University of Durban Westville and a Post Graduate Diploma in Industrial Relations from the University of Kwa-Zulu Natal. He has more than 20 years of experience in the publishing industry, having worked for Lexis Nexis as an editor and product manager. Singh took some time out of his busy schedule to speak to Chatsworth Tabloid about his life and work. Please describe a typical day in your life? Not being a morning person, I get out of bed under protest. Typically, the days are never the same. A lot of time is spent working the phones and responding to emails. I will spend some time reading through manuscripts, discussing cover designs with artists/designers. I try to avoid meetings, it’s more efficient to get things done via telephone and email. The odd day will involve a book launch. CT: What inspired you to start your company? AS: My work falls into the category of social entrepreneurship. Sure, I need to generate revenue to pay bills, but, I believe that the work I do helps people in the process. We have found that there are people and communities with stories to tell from our dark past who are ignored by mainstream publishers. If these stories are not published, they will disappear from our collective consciousness. Publishing these stories help to preserve memories and history and also helps to heal communities who have been wronged. CT: Please tell us more about the Booksellers in Mzansi project which you started? AS: I believe that the time has come for us as individuals to build “caring ecosystems”. Government, at times, wilfully or negligently seems to be at war with it’s own citizens. While, we may have the ideas to effect meaningful change in our country, we may not have the influence or power to make things happen on a macro scale. This should not deter us from making changes and impacting on others in our immediate spheres. The Booksellers of Mzansi is a project we started with the Denis Hurley Centre. We collect “pre-loved” books and hand these to homeless people who sell the books to earn a dignified living. Many of the homeless use the money they earn to pay for the shelter fees. We have 10 homeless booksellers who are part of the project and they are flourishing. This project puts caring before profit. It also allows us to meet with amazing people and to connect with people who love books. As a general rule, people who love books are generous, large-hearted people with lots of empathy. CT:You previously were a recipient of the eThekwini Mayoral Award for Crime Prevention. Tell us how you achieved this? AS: The Mayoral Award was given to me due to a project we started for township youth. We formed a soccer team called Ripple Effect 2010 and we used soccer as a platform to teach life-skills, help youth find jobs and we helped source training, etc for them. CT: As a journalist who worked for various publications, what were some of the highlights of your career? CT: What is the aim of the Durban Book Fair and your role within the project? AS: The aim of the Durban Book Fair is to build a reading culture in Durban, which is a UNESCO City of Literature. The Book Fair also gives a platform to local writers to network and market their books. The fair takes place on the first Sunday of every month at Mitchell Park. I am the co-founder of the Book Fair with Kiru Naidoo. CT: What advice do you have for up and coming writers in the community? AS: Firstly they should be wary of publishers asking for money to publish their books. If they go down this route they will have boxes of books and their bank balances will be about R40 000 lighter. Writers should be true to themselves and let us publishers worry about carrying the risk of publishing and selling their books. There isn’t just one way of reaching your goal, just be persistent. Learn as much as you can, hang out with the right people and ask writers who have walked the road for advice. Above all else, be patient, this is a long journey.